“What defined the ship, when it was afloat as a working vessel, were the working parts of the ship and even more importantly, the human crew and passengers who gave it ‘life’. 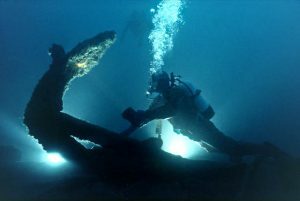 When a diver explores a wreck at the bottom of the sea, he or she sees an empty vehicle. The human element is no longer there. What gave the vessel its life has gone. This can be compared to the human body in death where its life essence – or soul – has also left.